Buy online 12 in. x 12 in. 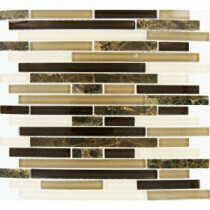 Royal Oaks Mesh-Mounted Mosaic Tile THDWG-SGL-ROBI-8MM and leave review or share with Your friends. With its smooth finish and attractive appearance, the MS International 12 in. x 12 in. Royal Oaks Mesh-Mounted Mosaic Tile is a great fit for your indoor or outdoor walls. The durable glass and stone tiles are frost resistant and can withstand reasonable amounts of water exposure.